Whether you bought your guitar for fun or you are using it professionally, you need to take care of it. Guitar manufacturers these days are exerting extra effort to provide quality instruments, so you should do your part by taking care of it properly. These maintenance tips for your guitar to help you keep it in top condition longer. Remove the strings only two or three at a time. This will minimize any unexpected change to next tension. Even if you are not changing the strings, you need to wipe them using a dry lint-free cloth after every session. Keeping the strings clean can extend their lifespan. Loose the spring slightly if you will clean the strings while still on your guitar and pinch the cloth around the string to remove fretboard and finger dirt. You don’t have to give too much attention to your fretboards. You can do the maintenance two or three times a year. The most important thing is not to alter the natural moisture that the fretboard collects from oils on your fingers. For a simple rubdown, take the strings off and use a soft, damp (not wet!) cloth. It is not good to have water droplets on your fretboards. Clean as you go down the board and keep the cloth turning so you will not transfer the dirt from one fret to another. For a very grimy fretboard finish off using a light rub over with extra fine #000 or #0000 steel wool. When removing grime, cover your guitar’s pickups using another cloth. The steel wool’s tiny particles will be attracted to the pickup magnets. You definitely do not want that to happen. To avoid this, cover your pickups when cleaning the fret using a steel wool. Use an old toothbrush to clean up the frets. Use one with a soft bristle. You may notice some hairline cracks on a dried-out fretboard. You can use a guitar conditioner to remove it. Or you can use one to two drops of oil into the fretboard to condition the parts with cracks. Make sure not to overdo it, and also use a soft, dry cloth to remove excess oil. You can use special guitar oil, no wax, no silicone and with fewer chemicals. You can use it to oil the board lightly, do this once a year. There is no need to be too abrasive on your guitar’s neck and body. You can do some polishing using a dry cloth, or if it is really dirty, a slightly damp cloth is enough. 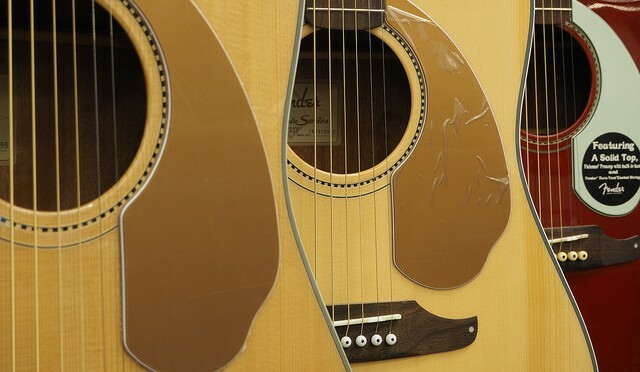 You can clean your guitar using specialized products like nitrocellulose lacquer. Squirt the product on a clean cloth and not directly on the guitar. Use different cloth for guitar’s body and fretboard. This will prevent you from transferring dirt from one part to another. Never use furniture polish on your guitar. The polished used for furniture will likely seep into the wood and can affect the density and sound. For bridges, tuners, nuts, and pickups, you do not have to do that much. You can use a slightly damp cloth in cleaning the bridge, but in the case of hard to remove grime you can use a soft toothbrush. To polish the metal tuners, you can dab a cloth with glass cleaner. Pickups may become a bit mucky. Never put moisture near them. Use dry, clean cloth to polish pickup covers. For blowing away dust, use compressed air spray. You can also use a quality, soft clean paintbrush to remove the dust before cleaning your guitar. Never expose the guitar into direct sunlight longer. It can damage and crack your guitar’s finish. Wipe it before putting it back in its case. Keep on top of your guitar’s maintenance needs and you’ll find it lasting for many years! This post was written by Alex Frank in association with Music Instruments Center.